Friday it rained in Pioneer Park. But that’s sort of like saying that Nicolas Cage starred in a new crappy movie on Friday. Late November afternoons in the Pacific Northwest are the epitome of grey and drizzle, so Friday was common in that way, but it was uncommon in more profound ways. Friday was a day for opportunities – opportunities presented, and in a rare departure from our culture’s growing indifference – opportunities seized. Pioneer Park, the Friday last, was drizzly and teeming with celestial pleasure. Following several hours of word stitching in my favorite coffee shop, the time for my departure had come, and while walking to my car, I meditated on my own feelings of the place, the Park – the way my heart’s inclined toward it the way many are inclined to a church. The Park is a church to me – the library courtyard like temple gates and the rustic clock tower like an old church steeple, and the Spirit – how my heart feels Him engaged there, in the lives of those who abide within and surrounding the Park. Circling near a candy cane entwined light post, there I caught sight of a familiar face – one of those faces that, for reasons unknown, stand off against the rest of them, and as I prepared to pass the man with the face, to say ‘hello’, I sensed the Spirit in a dance. “Hi Deano. How’s it going?” I asked. I’d had a brief exchange with the man the day prior, and I still remembered his name. He’d shared a bit of his story then – how he’d been staying with a group of other homeless, circulating weekly through a group of area churches that offered warm quarters for the winter. “What time’s your appointment?” I asked; he gave me a time that was yet over an hour off, which made me quite happy for Deano, because I knew that he was going to make it to see his doctor today, for he and I, we were, for a moment, part of something Larger. In the temple courts of my favorite church, the Park, wonders occur. I asked him where his doctor’s office was, and he quickly pulled a page, printed from the library computer, with his doctor’s name and address. Deano may be homeless, but he’s a pretty together guy, I discovered. “Come on, Deano. I’ll drive you there.” I said. 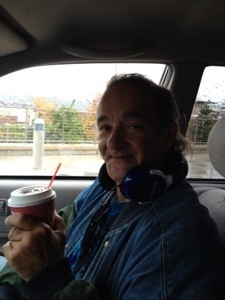 It was during our car ride to the Good Samaritan Medical Center, not more than ten minutes in length, that I gained an understanding of how truly together Deano is, and how beautiful is his spirit, as he uses his blessing of togetherness to aid and support other homeless folks he encounters – helps them with their public assistance paperwork, helps them with their doctor appointments, same as I was doing for him. “So, I’m a pretty good guy, I guess.” he sighed. “Yes, you’re a good guy, Deano.” I said. A good guy – a kind hearted, sincere guy, Deano is. A bit of a nervous guy as well, a bit scared of what may happen to him once the winter ends and the churches no longer send the bus to retrieve him, and what may happen if he gets sick out there on the streets. “When you got a sick heart, you have to be careful.” he said, and I worked to hold back a tear, because his words touched me, and I didn’t have a response for that statement. It’s true; I know that. You do gotta be careful with your heart. Deano is a wise man, as well. We reached the medical center, and I pulled into the roundabout by the front doors, paused there. Then I told Deano that I am a teller of stories, that his personality is one that makes for a compelling character, and I’d like to write his story. He asked me if I figured there’d be any money in this sort of story. “No,” I told him, “but if there ever should be, I’d happily give you a cut.” And as I spoke those words, I felt the warmth of God’s smile. Deano reminds me of my old friend, and that’s what I called him in my mind – Old Friend. His office was the traffic island in the middle of a four-lane road I took to work. He’d be there every morning, sometimes with his dog. I’d give him money of course, and we’d discuss his health – his arthritic leg and COPD. He had to use a cane. One day I saw him without the cane, and he was looking around for a substitute. The piece of wood he picked up didn’t work – too short, with rough ends. The light was red; I decided to take a chance of annoying the drivers behind it should it change, popped the trunk open, hopped out and got Mom’s old cane out of it. I handed it to him with instructions on how to adjust it. The light turned green, but no one honked at me. He used that cane for years. I moved away and don’t see him anymore. I hope he’s alright. What a great story! They both are wonderful stories of the human condition and how we help people everywhere. It warms my heart to know there are such generous souls out there. And hope that Deano and all the other people out there have someone who looks out for them as well! I had trouble reading past the fact that Central Perk is your favorite coffee shop. The only people that go there are people who hate crowds. Oh, wait. You hate crowds. Makes sense. Love your heart for the underdog… both in people and coffee shops. I tried Anthem recently, as a matter of fact. (It was the Tacoma one). Awesome decor and atmosphere, but just not the same. The owners of Central are beautiful people. They don’t mind if I occupy a table for seven hours and refill my $1.50 coffee 17 times. If heaven is an endless day of writing at Central Perk, take me there now. Luke, you have such a wonderful heart for writing and for the people you write about! Deano sounds like a great person who just needs someone to come alongside him, as you did. I know he will pass it on to others. 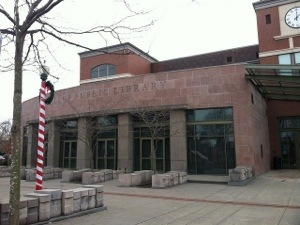 I loved Central Perk Coffee shop and look forward to checking out the library and the park soon! Keep writing Legionwriter! Nice story especially for this time of the year. Caring for one and other is the way we should all live. Right you are, dear one. enjoyed this. like the new direction, faces in the sea. word stitching: cool. never thought of the phrase. I’ve been a bit out of the loop. have to catch up on some of your posts. Hope you are well. Thanks sir. The Faces in the Sea thing I’ve been contemplating for months, and it just finally materialized recently – not the way I thought it would, which often seems to happen with writing. Thanks for popping in! Lucas, you sly dog, you! First I’m cracking up at the Nick Cage line, then you go and make my eyes well up with the gentle spirit of Deano and that generous heart of yours. Thank you for sharing this, it was wonderful! What a kind deed, Lucas. We all should be so kind and giving, and this world be a gentler place. You’re very inspiring to me. Thanks so much. I think with events, “coincidences” like these, it’s actually the Maker who inspires. We stumble into things like this all the time. Personally, I tend to miss them more than I catch them. This was a caught one. Thanks, Ms. Gray. I love it would you show your loveliness. You’re a very warm and insightful human being, my friend. Thank you for this post. Quite a compliment, coming from Hook the Insightful himself. Thanks, sir. These Faces in the Sea are gorgeous recounts. Hope you keep running into inspirational people, and sharing their awesomeness with us all 🙂 And your awesomeness too, of course – I think your writing style’s kind of grown, since I read it last. This is a good thing. Thanks for the high compliments! I hope to do more Faces soon. I did these two while I had a week off work. It’s easier to sort of run into people when you have no place to be. Hope I can cram some more encounters in soon! It’s amazing how many people you walk past without noticing, every day, as you do your thing. I love that you’re sharing a little bit of their stories here. Makes me wonder what would happen if more people stopped to chat instead of rushing around with their eyes lowered to avoid unnecessary human contact. So true, dear Jen. Thanks so much for reading. I love these stories and love that you are sharing them. I’ll be back to read the rest of this Sea of Faces series! Thanks for taking part in the journey of touching people. God bless!